Learning how to clean gutters is one of the most important house maintenance tasks to perform on the exterior of your property. Neglecting rain gutter cleaning and its maintenance might result in damage and costly repairs of the soffit, fascia, house wall (exterior and interior), roof decking surfaces, and other structures surrounding your property. Rain gutter cleaning must be performed more often if there are trees surrounding your house or if there are trees in the near neighborhood. During the fall, when all those trees start shedding their leaves, you may need to have gutter cleaning performed several times. Remember to perform your final rain gutter cleaning, gutter maintenance and downspout maintenance / check-up at the end of the fall, when all tree leaves have disappeared. The safest method to find out how your gutters are performing and if the gutter cleaning would be required is to go outside during the rain and check your downspouts. For a lightly contaminated rain gutter cleaning you can use a regular garden hose and flush all the deposits towards the downspout, then pick up anything that didn’t make its way down in the downspout attachment area. It might be possible to perform your gutter cleaning from the ground by using a garden hose attachment / extension. 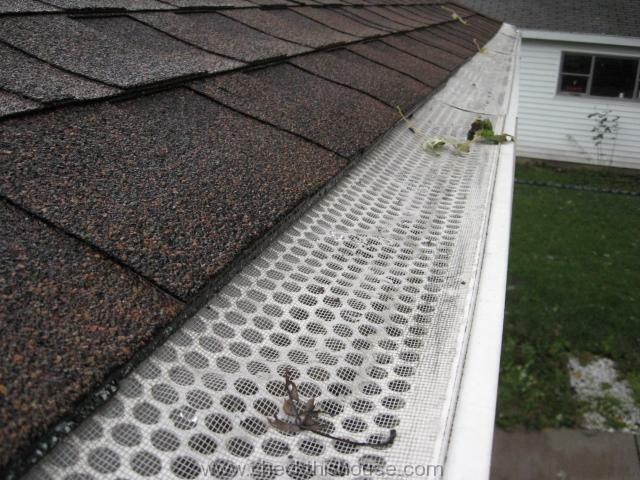 In case you have some type of the gutter leaf guards installed, you’ll need to remove them first. However, such gutter cleaning procedure may not work on years of deposits inside the gutter and you’ll need to pick up all the decomposed leaves and debris by hand. While performing gutter cleaning use utility gloves (preferably rubberized) to protect your hands from gutters sharp edges and joint screws. Safety glasses are also recommended. For the clogged downspout, try to use your garden hose – just make sure the bottom of the downspout is open and free of debris before you stick the hose into the top opening. Filling a completely clogged rain gutter downspout with water will put a lot of stress on all joints and downspout brackets – it might cause your entire downspout assembly to collapse. 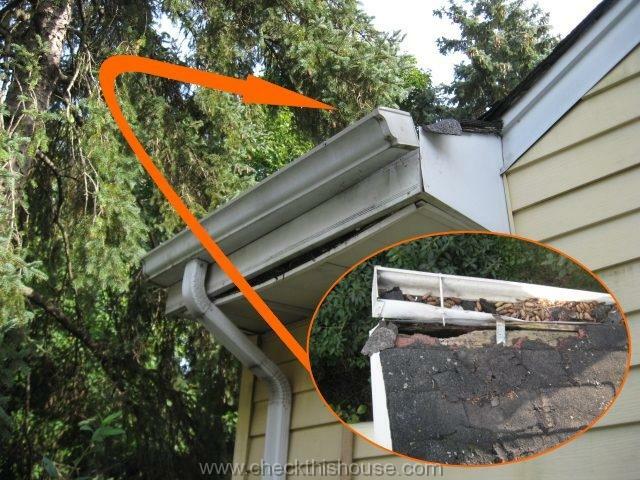 For more about downspout maintenance follow this link: Roof rain gutter downspout cleaning. There are various tools available on the market and some of them might speed-up your gutter maintenance process, but the old-fashioned way (100% manual) will give you the most satisfaction :-), just be extremely careful and outsource it if you don’t fell 100% comfortable with gutter cleaning by yourself. All it takes to repair a leaking rain gutter seam is a few minutes of your time – perform gutter cleaning in this leaking area, remove all debris and contamination, and apply Dap 27062 Butyl-Flex Gutter and Flashing Caulk, or a similar sealant designed for that purpose. 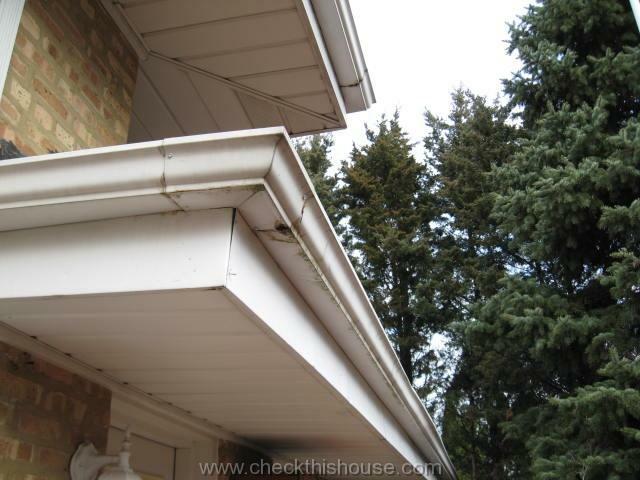 After it stops raining, look at the gutter corners, around the downspout attachment area, and any other seams. Depending on the installation, a leaking seam may or may not cause any problems. Surface beneath the gutter protected by a good quality paint (no matter how good it is, it will not last forever), or aluminum capping will survive that leak. 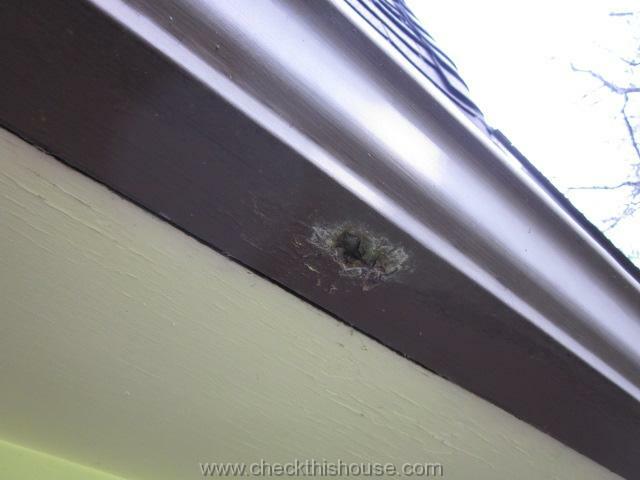 You have to look for damage in the area directly next and below the leaking gutter seam, there might be a rotten soffit / fascia board, deteriorating brick or mortar, water damaged siding or even moisture / water penetrating the interior of the house. 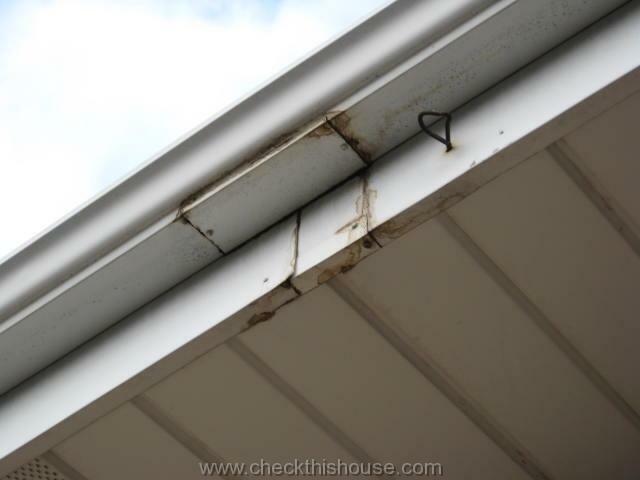 If you notice any stains underneath the rain gutter, I’d also recommend to check the roof surface directly above this area – it might be already damaged. On taller houses, with roofs above the tree line, gutter cleaning may only be required once a year (or every couple of years), usually in the downspout attachment area. However, their seams might break and start leaking periodically as well. If the metal gutter material feels solid, remove as much rust as possible with a steel wool, treat the area with a liquid rust remover, apply the rust converter and than mach the gutter color with some corrosion resistant paint. 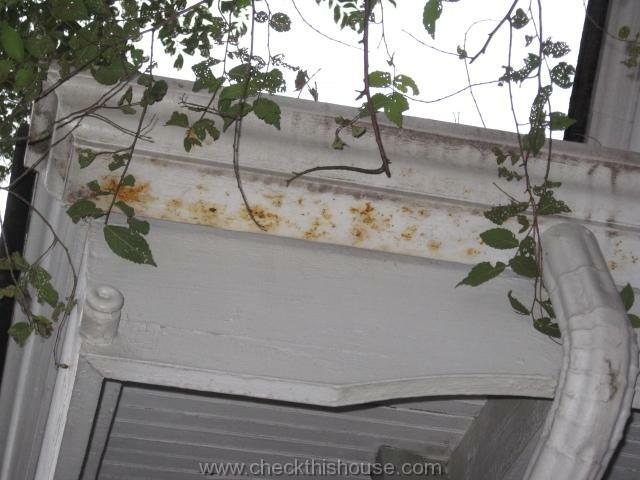 Routine rain gutter cleaning may often prevent corrosion. Simply because there would be no standing water inside the gutter or contaminated sections where trapped moisture accelerates deterioration process of rain gutter material such as copper, aluminum, or galvanized steel. Rain gutter guards and screens help to lower the amount of maintenance and gutter cleaning. There are several different types of rain gutter guards, so do some research before you spend money. I personally recommend plastic guards, which I installed on my own gutters several years ago. They have round holes on the surface and a fine screen / micro mash on top of it. This prevents debris falling off the trees from contaminating the gutter. Anything that accumulates on top of the screen will be eventually washed off by the rain or blown off the surface with the wind, thus reducing your gutter cleaning tasks to minimum. Another thing to consider is the rain gutter guard color – this particular type comes in white and brown, at least in my local home improvement stores. Believe it or not, the color has some impact on the amount of your gutter cleaning time. Why is the rain gutter screen / guard color important – if your roof receives a lot of sun, brown gutter guards made out of plastic will absorb lots of heat and start bending and changing its dimensions over time. This is what happened on my roof and resulted in significant gaps between individual sections … and more rain gutter cleaning / maintenance. There is a variety of other products that minimize your gutter cleaning efforts (or at lest this is what they claim) on the market like foam and brush-like inserts that in my opinion will require a lot of maintenance. For those who are willing to invest some serious money, there’s a Gutter Helmet® system (and a few other similar products) that achieve the same goal as a simple plastic screen with a micro mash. 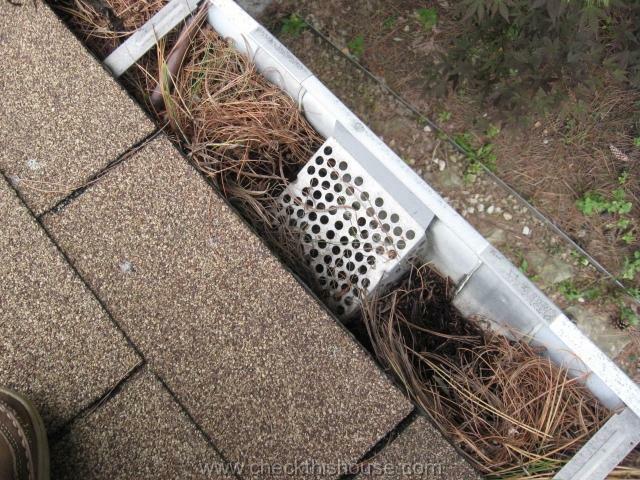 Another thing that helps to cut our rain gutter cleaning time or rather downspout cleaning is a gutter strainers. Those small devices are installed inside or on top of the rain gutter outlet, in most cases partially inserted into the downspout. They prevent leafs and debris from clogging your downspouts and work fine for as long as you perform gutter cleaning on regular basis. 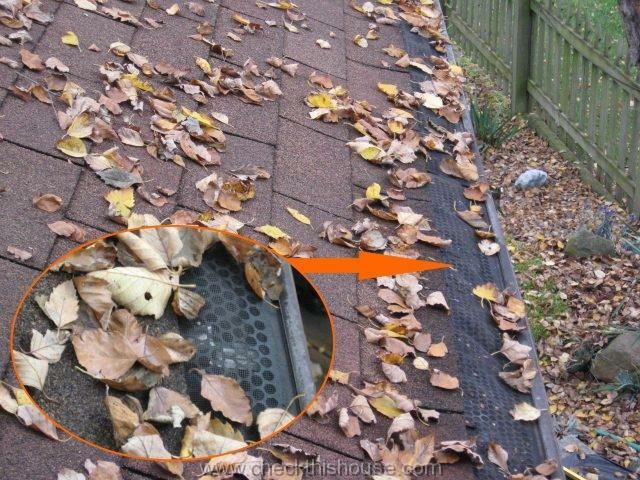 Leafs and debris that start accumulating around the strainer will eventually block it completely, and cause the gutter to overflow. However, if you have no trees at / and / or around your property, the rain gutter strainer is not necessary. Small debris carried by wind will simply flow down the downspout without accumulating around the strainer and having any negative impact on gutter cleaning efforts. In such case a missing strainer may save you from gutter cleaning.